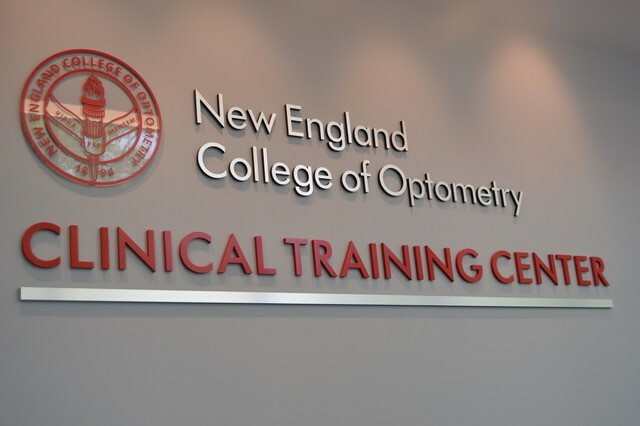 New England College of Optometry (NECO) is pleased to announce the opening of its new NECO Clinical Training Center for students. The Clinical Training Center (CTC) provides a state-of-the-art learning facility with traditional and high-tech eye care instruments and advanced learning technology. The College aims to prepare students to provide care in all types of clinical practice. The CTC includes two demonstration labs, a high-tech classroom, and twenty fully equipped exam lanes for student training with monitors displaying each work space. The lanes include traditional and digital instruments from multiple manufacturers to provide our students with experience in the various systems and tools they will encounter in their clinical rotations. Instrumentation in the CTC includes Bluetooth slit lamp imaging systems, digital phoropters, digital acuity charts, and video binocular indirect ophthalmoscopes (BIO) from a variety of companies. In addition to the 20 exam lanes, there are four special testing lanes that will introduce students to up-and-coming technology and new innovations as they evolve to keep the NECO Clinical Training Center at the forefront of changes in the field of eye care, preparing students for the present as well as the future as it unfolds. 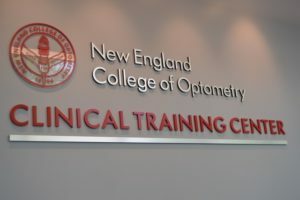 New England College of Optometry is committed to developing best practices in academic and clinical learning. The technology at the CTC allows students and faculty to observe one or more exam lanes in real time through a network of webcams, slit lamps and BIO image capturing systems, and overhead cameras. Students can access these recordings for self-evaluation, review, and discussion.